February 24, 2019 (15:00 hrs): NOORDWIJK, Boekhandel/Cultuurcafé van der Meer, De Keuvel 1. Full concert in this book store, fully acoustic with guest player Maut on sax and percussion! March 27, 2019 (21:30 hrs): ROTTERDAM, Café de Bel, Gerard Scholtenstraat 61-b. Full concert. March 31, 2019 (14:00 hrs): HILVERSUM, De Vorstin, Koninginneweg 44. I will play in the cafe’s open stage afternoon. April 12, 2019 (21:00 hrs): GOUDA, Studio Gonz, Turfsingel 36. Full concert; double bill with fellow singer-songwriter Big Al. June 1, 2019: GORSSEL, private festival. February 5, 2019 (21:00 hrs): AMSTERDAM, De Nieuwe Anita, Frederik Hendrikstraat 111. Really acoustic set at “Witte Gei’t?” evening. January 10, 2019 (20:00 hrs): AMSTERDAM, Zaal 100, de Wittenstraat 100. I will be back at this wonderful countercultural place. December 19, 2018 (22:00 hrs): LEEUWARDEN, Paddy O’Ryan, Tweebaksmarkt 49. Full concert. December 7, 2018 (evening): THE HAGUE, O’Casey’s Irish Pub, Noordeinde 140. I will play about five songs in an evening with other artists and bands. November 8, 2018 (21:00 hrs): NIJMEGEN, Kafe Bijstand, Van Welderenstraat 104. Full concert. October 20, 2018 (16-18 hrs): WOERDEN, live radio show at Podium 107.1. Listen online. October 18, 2018 (21:00 hrs): VENLO, Grenswerk, Peperstraat 10. Full concert. October 7, 2018 (15:00 hrs): DEN BOSCH, Muziekcafé Lohengrin, Erasmusstraat 9. Full concert on a Sunday afternoon, double bill with singer-songwriter Roger Hammond. September 27, 2018 (20-22 hrs): ZANDVOORT, live radio show at Alternative FM. Listen online at altfm.nl. September 20, 2018 (20:45 hrs): AMSTERDAM, Dokhuis Galerie, Plantage Doklaan 8-12. 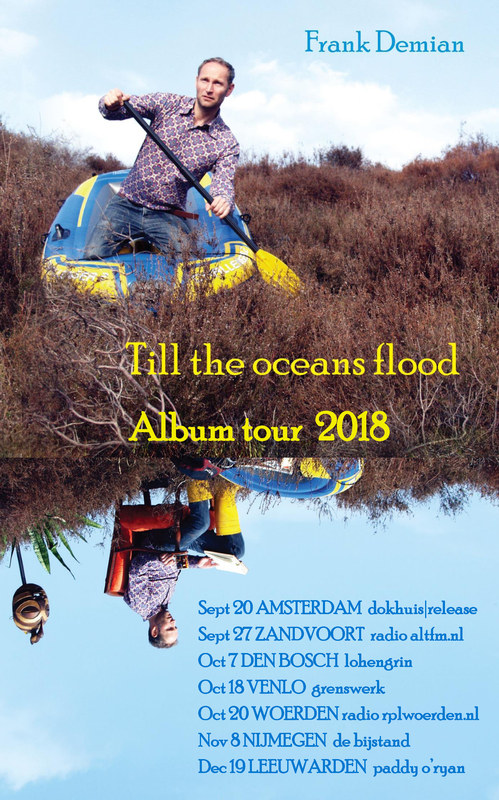 Album release party of the new album Till The Oceans Flood. August 31, 2018 (21:00 hrs): ROTTERDAM, Hostel Room, Van Vollenhovenstraat 62. Short concert. July 24, 2018 (20:00 hrs): AMSTERDAM, Amsterdam Songwriters Guild, in Cafe de Koe, Marnixstraat 381. Short performance. June 1, 2018 (20:00 hrs): THE HAGUE, O’Casey’s Irish Pub, Noordeinde 140. I will play about five songs in an evening with other artists and bands. April 3, 2018 (21:00 hrs): AMSTERDAM, Amsterdam Songwriters Guild, in Cafe de Koe, Marnixstraat 381. I will play three songs in the open mic night. January 30, 2018 (21:00 hrs): AMSTERDAM, Amsterdam Songwriters Guild, in Cafe de Koe, Marnixstraat 381. I will play three songs in the open mic night. December 14, 2017 (20:00 hrs): AMSTERDAM, Cinetol/Tolbar, Tolstraat 182. Escape the cold and listen to warm-blooded singer-songwriters. I will play a duo concert with Roger Hammond, a Welshman known from the Amsterdam Songwriters Guild. Enjoy “An evening with Roger Hammond and Frank Demian“. October 1, 2017 (20:00 hrs): LILLE / FRANCE, Joy’s Bar, 33 Rue Saint-Andre. My first concert in France will be in this music bar. August 30, 2017 (20:30 hrs): AMSTERDAM, Generator Hostel, Mauritskade 57. Invited open mic session hosted by Danielle, where I will play a set equalling the duration of one side of an LP. Come and enjoy the other artists ánd Frank Demian! July 18, 2017 (21:00 hrs): AMSTERDAM, Amsterdam Songwriters Guild, in Cafe de Koe, Marnixstraat 381. Three songs in the open mic night. The best place to hear my new songs! May 25, 2017 (20:30 hrs), BERLIN / GERMANY, Ofen Bar, Hobrechtstraße 35, Kreuzberg. Short performance; artists and audience will listen through wireless headphones, so that they can really listen and the windows can stay open! May 11, 2017 (22:00 hrs): THE HAGUE, Muziekcafe de Paap, Papestraat 32. Full concert. April 6, 2017 (20:30 hrs): DEN BOSCH, Muziekcafe Lohengrin, Erasmusstraat 9. Full concert. February 21, 2017 (21:00 hrs): AMSTERDAM, Amsterdam Songwriters Guild, in Cafe de Koe, Marnixstraat 381. Three songs in the open mic night. The best place to hear my new songs! January 27, 2017 (20:00 hrs): AMSTERDAM, Buurtboerderij ‘Ons Genoegen’, Spaarndammerdijk 319. Full concert. December 8, 2016 (20:00 hrs): AMSTERDAM, Zaal 100, de Wittenstraat 100. I will be back at this wonderful countercultural place. November 22, 2016 (21:00 hrs): AMSTERDAM, Amsterdam Songwriters Guild, in Cafe de Koe, Marnixstraat 381. Three songs in the open mic night and I will bring a special guest from South Africa. September 11, 2016 (details to follow): WAHLWILLER (Zuid-Limburg), Pandora’s Box Songwriters Fest (3th Edition), Oude Baan 21. The small Pandora theatre yearly organises this two-day singer-songwriter festival. I will take the stage on the second day. August 18, 2016 (20-22 hrs): NIEUWERKERK, live radio performance on “Taste of Music live” at Omroep Zuidplas. Listen live! July 26, 2016 (20:30 hrs), AMSTERDAM, Amsterdam Songwriters Guild, in Cafe de Koe, Marnixstraat 381. Three songs in the open mic night. July 1, 2016 (20:00 hrs): AMSTERDAM, Buurtboerderij ‘Ons Genoegen’, Spaarndammerdijk 319. Full concert. June 19, 2016 (14:00 hrs): WAGENINGEN, Eten op Rolletjes, Arboretum de Dreijen. At this food festival I played on the field. May 29, 2016 (15:00 hrs): AMSTERDAM, Ruigoord. In a combined ‘Sunday Valentines’ program with other artists I will play about five songs. May 14, 2016 (20:00 hrs): COLOGNE / GERMANY, Kulturcafe Lichtung, Ubierring 13, 50678 Köln. Full concert & my first concert in Germany! March 27, 2016 (20:00 hrs): PALM BEACH / ARUBA, Hard Rock Cafe, Palm Beach 55. On this tropical island I played a full concert, in the hot wind. March 10, 2016 (22:00 hrs): THE HAGUE, Muziekcafe de Paap, Papestraat 32. Full concert. March 1, 2016 (20:30 hrs), AMSTERDAM, Amsterdam Songwriters Guild, in Cafe de Koe, Marnixstraat 381 Three songs in the open mic night. January 15, 2016 (21:00 hrs): ALPHEN AAN DE RIJN, Studio Alphen. In the radio show ‘Vrijdagavond virus’ I played two live songs and was interviewed. January 7, 2016 (20:00 hrs): AMSTERDAM, OT301 Mixtree, Overtoom 301. Full concert. In the same building as my album releaseparty, I will now play in the Mixtree venue. December 3, 2015 (22:00 hrs): THE HAGUE, Muziekcafe de Paap, Papestraat 32. Full concert. November 10, 2015 (20:30 hrs): AMSTERDAM, Amsterdam Songwriters Guild, at the Backstage Hotel, Leidsekade 114. I will “return home” with three songs in the open mic evening, together with all the other singer-songwriters. October 31, 2015 (21:00 hrs): ZEVENAAR, Muziekcafe De Lantaern, De Hooge Bongert 3. Full concert, as final performer of an open stage evening. October 25, 2015 (15:00 hrs): DEN BOSCH, Muziekcafe Lohengrin, Erasmusstraat 9. Full concert, on a Sunday afternoon, double bill with support act Alex Goodger. October 16, 2015 (evening): TUZLA / BOSNIA-HERZEGOVINA, Urban Beatz Lounge Bar, Turalibegova 13. Full concert — the first concert of my European tour! October 4, 2015 (15:00 hrs): ARNHEM, Boekhandel Hijman Ongerijmd, Grote Oord 15. Concert inbetween the bookshelves of this Arnhem bookshop. I will play really acoustic for about 45 minutes. September 23, 2015 (20:30 hrs): AMSTELVEEN, P60, Stadsplein 100a. Full concert. Double bill with fellow singer-songwriter Jacob de Berker from the UK. September 20, 2015 (21:00 hrs): UTRECHT, ‘t Oude Pothuys, Oudegracht 279. Full concert. September 1, 2015 (19:30 hrs): AMSTERDAM, Koperen Knoop, Van Limburg Stirumstraat 133. I will play about six songs in an open stage setting with other artists. July 7, 2015 (20:30 hrs): AMSTERDAM, Amsterdam Songwriters Guild, at the Backstage Hotel, Leidsekade 114. I played the usual three songs in the “open mic” together with thirteen (!) other singer-songwriters. Before 2015 I gave several concerts, first in Twente region and later in Amsterdam…some I remember!